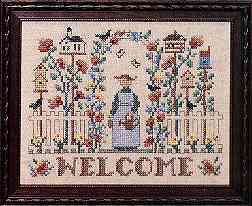 Home > Gardening > Birdlovers Garden 8" x 10"
A craft cross stitch stamped sampler kit would be a lovely "Welcome" to your favorite place.This printed cross stitch sampler shows a happy gardener leaving her second home in sheer happiness.Sewing stamped sampler kits is a happy experience. Very high quality! Great instructions, nice thread, beautiful colors, and it looks amazing when you are done! Very satisfied and will buy other designs in the future. Fast shipping, all questions answered quickly, pretty kits, I have been ordering from Country Stitching for years!